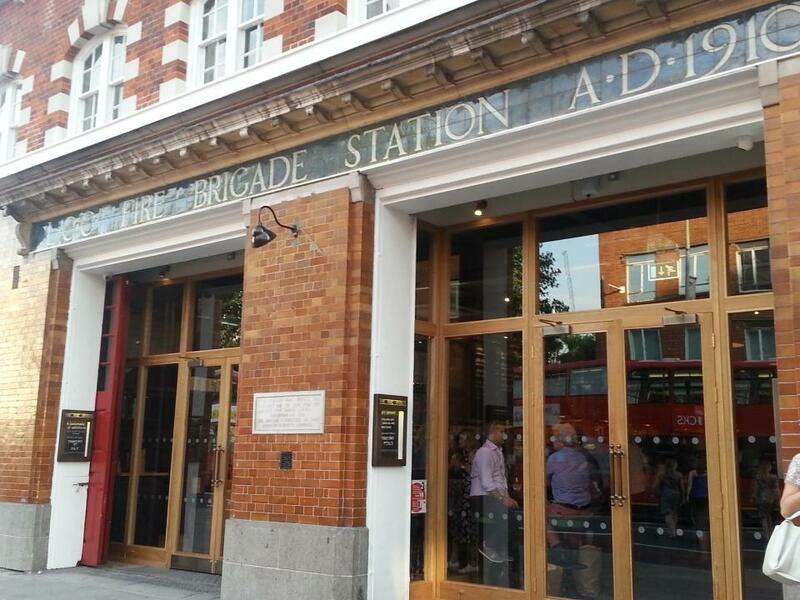 We were keen to check out The Fire Station, as we had had previous fun evenings there and wanted to see how they had redesigned the space. The remodeled venue has a more open feel with the curved bar that is more inviting than the old one, which felt like there was a defined line between the bar and restaurant rather than now one flowing into the other. They have high bar stools and tables plus an open plan restaurant area with some soft furnishings. Also, they have retained some of the key characteristics of the fire station – though we were unable to spot where the pole used to be! 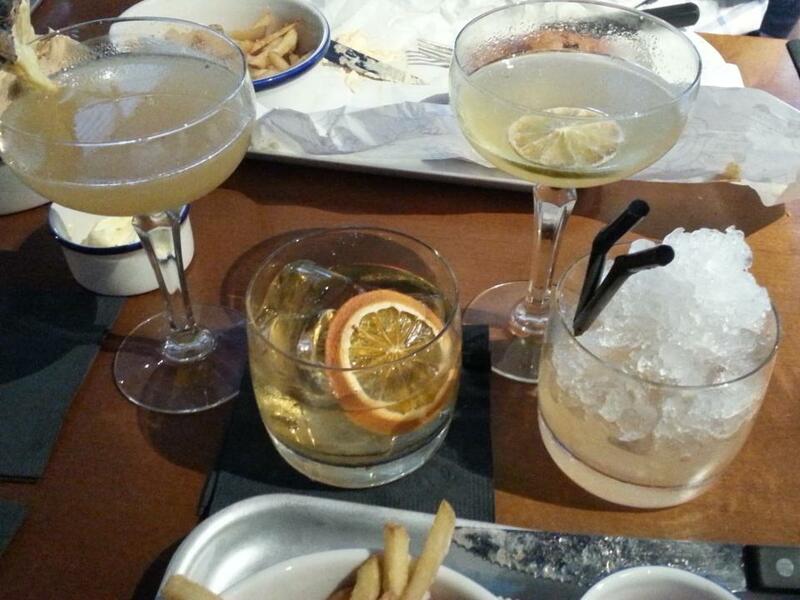 Whilst we made our menu choices, we sipped on our cocktails of: Cinnamon-Smoked Old Fashioned, Honey & Basil Smoked Daiquiri, Pineapple & Black Pepper Margarita and East 8 Old Up. Their in-house made cinnamon syrup added a great new dimension to a classic old fashioned. Also, their pineapple, black pepper combination added an interesting spin on a traditional margarita. 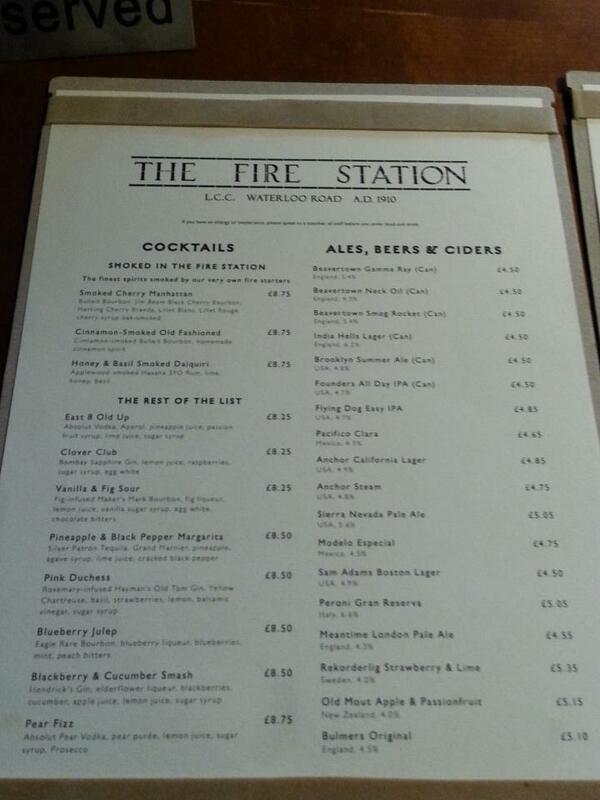 Regarding the menu, they have retained some of the classics but also added some new welcome additions. We decided to try their new glazed short rib and the chicken burger, with sides of parmesan fries and a spicy American coleslaw. 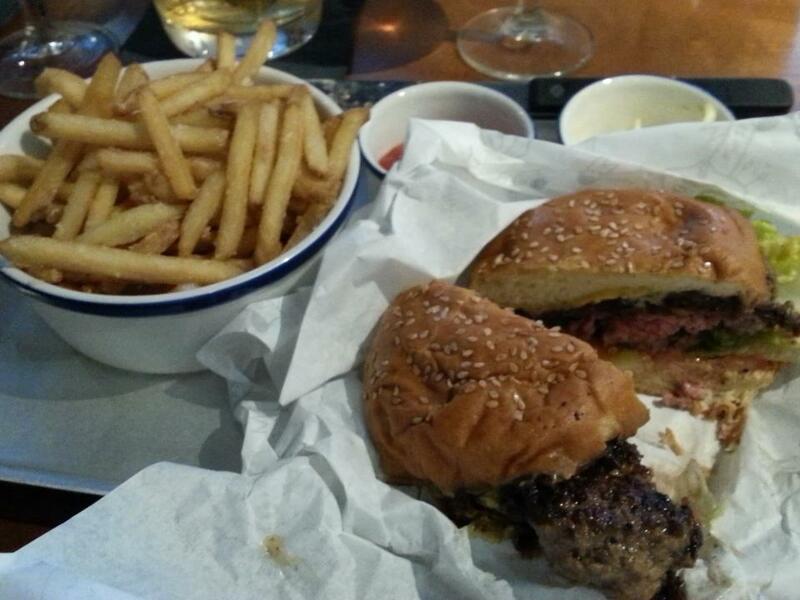 The demi-brioche bun was sweet and rich and the perfect foil for the meat feast burger and the glazed short rib. 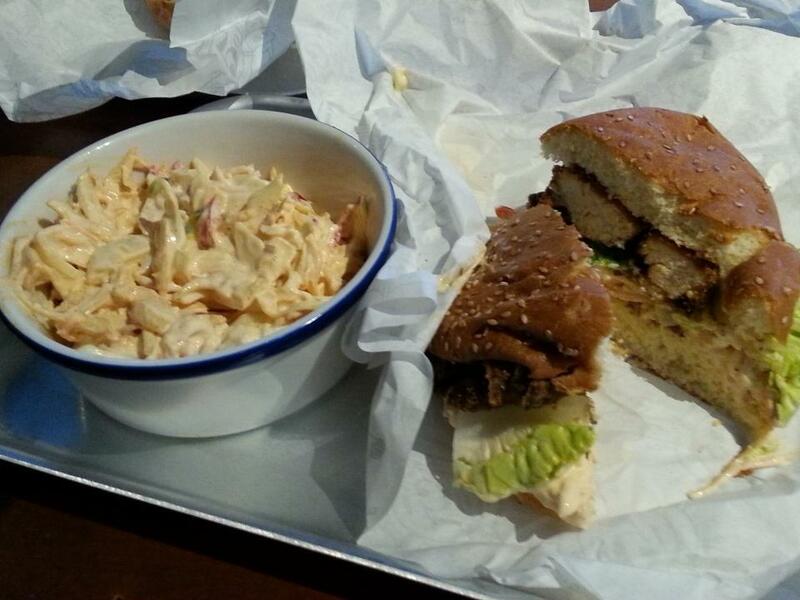 The coleslaw was very good with a proper kick to it, though the fries were a bit salty for our liking. Sadly they had run out of desserts, so we have decided to return soon with our sights set on their salted caramel brownies and brownie sundae. They are currently running a soft launch pre their official re-opening date of Thursday 9th July, 2015 . Go check them out! Arriving in 9 days and counting: Le Chalet is arriving on the rooftop of Selfridges (in the place of current sister restaurant On the Roof with Q) on 22nd October, 2014, bringing an Alpine-style BBQ menu with its Hot Chocolate Bar delights and feel of staying in a log cabin to London! 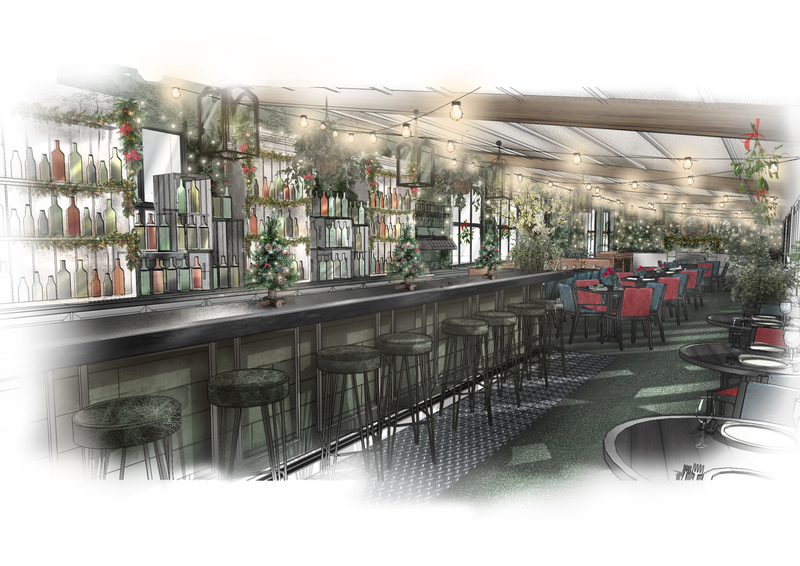 Des McDonald and his Q Grill Group team will transform Selfridges Roof Top into a winter wonderland transporting their customers to an Alpine retreat. Des McDonald has had great success with his The Fish & Chip Shop chain, and also On the Roof with Q pop-up venue. Alexander Waterworth Interiors have tried to recreate a traditional ski chalet with wintry ferns and timber branches to create that winter ambiance. Le Chalet will have capacity for 120 guests, including a bar and dining counter. On the drinks front, Le Chalet will be serving a wide selection of handpicked wines and a range of finest grand reserve drinks. It will also feature a hot chocolate cocktail bar serving cocktails that will send you to chocolate heaven including ‘El Dorado’ a delicious concoction of El Dorado, cinnamon and hot chocolate, ‘Nutella’; Hazelnut with Amaretto, dark chocolate and hot chocolate, and ‘Double Choc’ a blend of Courvoisier Exclusif, white chocolate and hot chocolate; or for the health conscious a ‘The Juicery Après-Ski Menu’, by Cindy Palusamy’s successful New York The Juicery, with drinks including Superfood hot chocolate, Espresso maca, Superpower espresso shot and Superfood teas. They will be cooking up a storm with their delicious Alpine-style BBQ menu plus other special morsels available from their crab and shellfish bar. Also there will be a hot chocolate bar on the terrace to really get into that chilly wintery spirit whilst huddling in the log cabin also on the terrace designed to escape the cold weather. Le Chalet’s kitchen will be headed up by Chris Dargavel, the Head Chef at On the Roof with Q and will be overseen by Lee Bull, Group Executive Chef. Fergal Dooley, previously at Holborn Dining Room will be the General Manager and the bar will be run by Allan Farrell, former Bar Manager at Sushihno. They will be using quality seasonal produce, locally sourced and simply cooked to produce the dishes that will take you on an Alpine adventure. 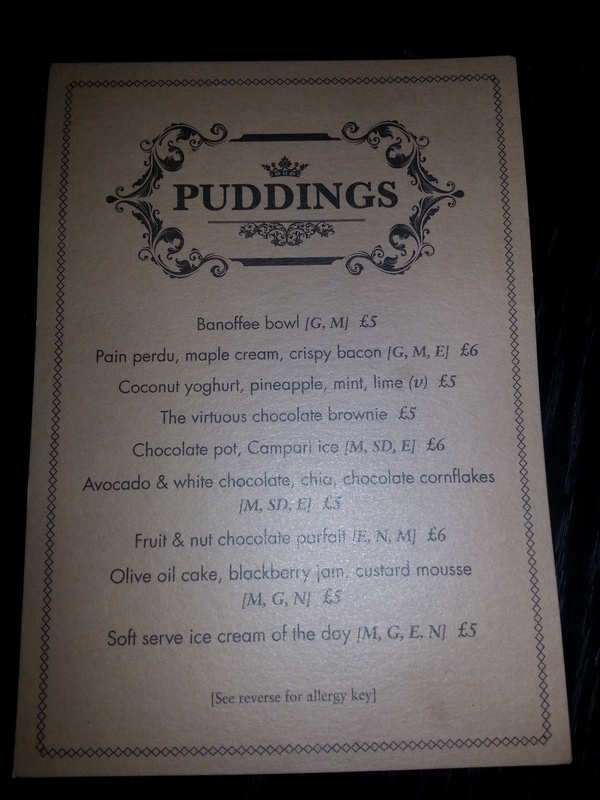 The dessert menu has been designed by Siobhan Ambrose, Head Pastry Chef for Des McDonald Restaurants. Looking forward to sinking our teeth into the BBQ treats like roast suckling pig with apple and black pudding fritters from the Alpine-style BBQ menu, Cornish Crab with pickled celeriac, and Buttermilk Crispy Chicken with blue cheese fondue. Not forgetting to keep our separate dessert stomach happy with the Hot Chocolate Bar and desserts including Eggnog snow egg, Apple streusel served with lashings of custard, and Brandy and vanilla rice pudding! When are they opening I hear you ask? Where are they going to be located? Thank you to the Q Grill group and Sophie at Neil Reading Public Relations for providing the useful background information to this hotly anticipated new venture. Coming Soon: FRESCOBALDI RESTAURANT TO OPEN IN MAYFAIR THIS AUTUMN ! Breaking News: Keep an eye out for the Autumn launch of Ristorante Frescobaldi bringing the Italian culinary delights of Tuscany to London! The Frescobaldi family are one of Italy’s oldest and most respected wine dynasties and are open their first restaurant and wine bar in the UK as a joint venture with the Good Food Society. This new venue will be part of the successful Italian group of Dei Frescobaldi restaurants and wine bars (launched in 1999) who are acclaimed for their welcoming atmosphere and Tuscan hospitality as well as exquisite food and wine pairings, specialising in their own contemporary interpretation of classic Tuscan dishes. 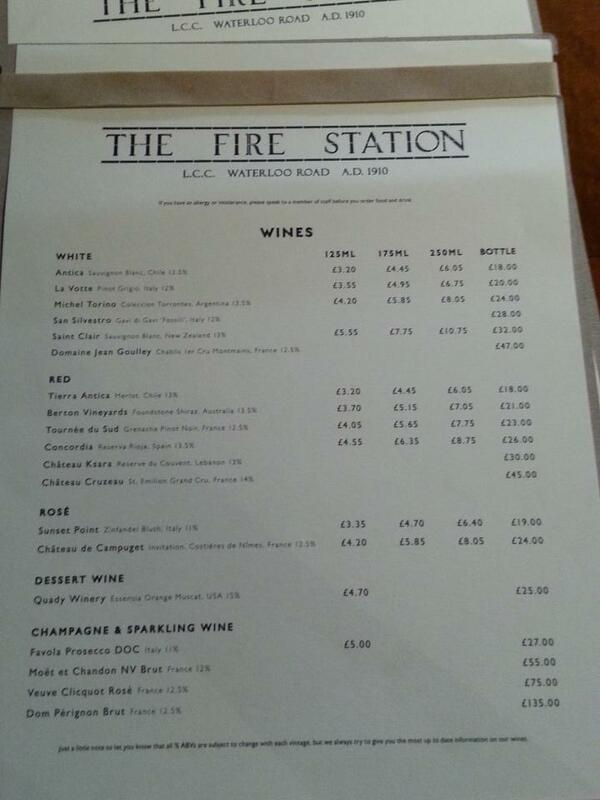 The wine list features an array of award-winning wines produced by Marchesi de’ Frescobaldi, with their vineyards predominantly in the hills around Florence and Siena, including well known varieties like Mormoreto, a single-vineyard cru of Castello di Nipozzano, through to their flagship Frescobaldi cuvée and Brunello di Montalcino Castelgiocondo Riserva. Frescobaldi have appointed Roberto Reatini as head chef to create a scintillating menu of his modern interpretation of classic Tuscan dishes; and who is a talented young chef with an impressive culinary curriculum vitae including postings as sous chef at Zafferano restaurant and prior to this as senior sous chef at Shoreditch House, were he worked alongside head chef Michele Nargi. Cannot wait to try culinary delights including the potatoes gnocchi, red mullet, ‘nduja & almond; veal cheek pappardelle; and ossobuco. Though, very importantly, ensuring we save room for tempting sounding desserts like mille-feuille with caramelised apricots! Thank you to the Dei Frescobaldi group and Amelie at Jori White Public Relations for providing the useful background information to this hotly anticipated new venture. Tredwell is the new restaurant near Covent Garden from Marcus Wareing. More casual in style it focuses on small sharing plates and, before you yawn and roll your eyes; I think the sharing plates trend has taken off because it allows you to try so many different things without being stuck with one thing and getting bored halfway through, or worse having food envy if someone picked something better than you! Whilst we made our menu choices, and during the evening, bartender Victor appeared as the walking talking cocktail list (they did not have a cocktail menu as yet when we visited), enquiring what drinks/ spirits/ cocktails we liked and made suggestions as to creations they were going to have on their cocktail list/ bar menu, and brought the final creations for us to try. We kicked off with cocktails including Sidecar (their version with Dorset Brandy and Cider) and a Sparkling Cyanide (Chartreuse, Maraschino, and lime juice) – J loved these especially the summery apple notes from the Sidecar. My small plates were chicken liver mousse with bacon jam (£8) and charred squash with raisins, goats curd and hazelnuts (£7). The addition of bacon jam to the mousse made this insanely good, we ordered extra toast so we could scoop out every last bit! The charred squash didn’t have quite the same sweetness as when I roast it at home, maybe it needed longer slower cooking? J small plates were pork belly buns topped with ginger and apple (£5). Frankly, I wish we had got the large version of this, tiny bite sized morsels of perfection. His second was dorset crab with mango chutney on toast (£9). I wasn’t quite as taken with this, for me the mango chutney overpowered the delicate sweetness of the crab. 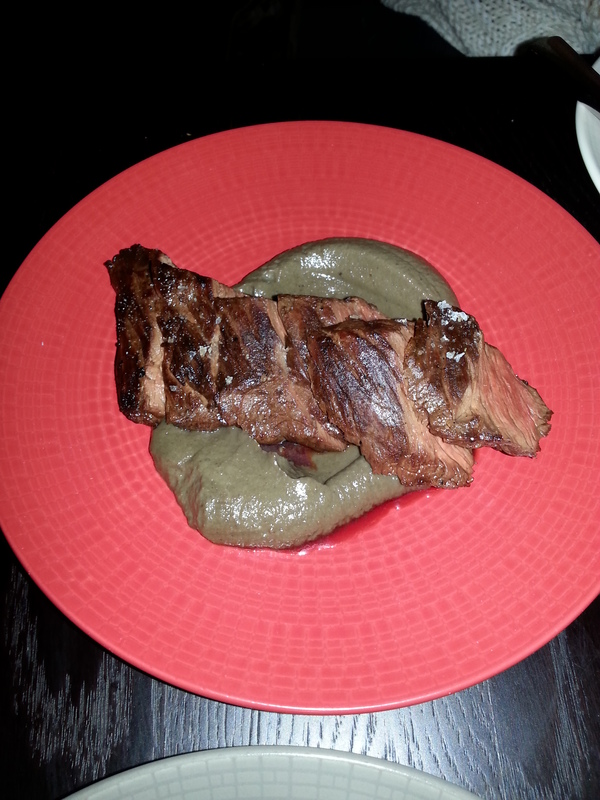 For our large plates, J got the onglet steak with mushroom ketchup (£15). The mushroom ketchup looked an intimidating shade of grey but actually had a real depth of flavour. 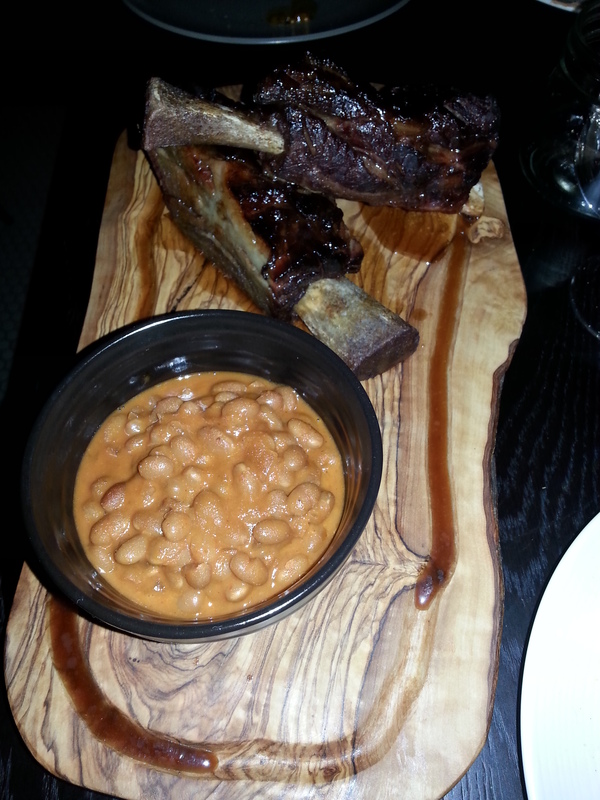 My large plate was beef shortrib with baked beans (£38). The beef was meltingly tender but by this point we were quite full and couldn’t really do this dish justice. I would actually lean towards getting more small plates, there were so many we had our eye on, the pork cheeks, the squid and bottarga crumb, we will be coming back to work our way through the rest of the menu. Last but definitely not least was dessert. I got the pain perdu with maple cream and bacon (£6). If there’s any take home message from this review it’s that bacon makes everything better, even dessert! J got a chocolate pot topped with Campari ice (£6). J said he would have liked a stronger Campari flavour in the ice, but the pot itself was good. J wanted something sweet as a nightcap and Victor created their version of a Clock and Dagger – with Grand Marnier, Vermouth, Cognac and ginger beer, decorated with an orange peel. A perfect way to end the meal! 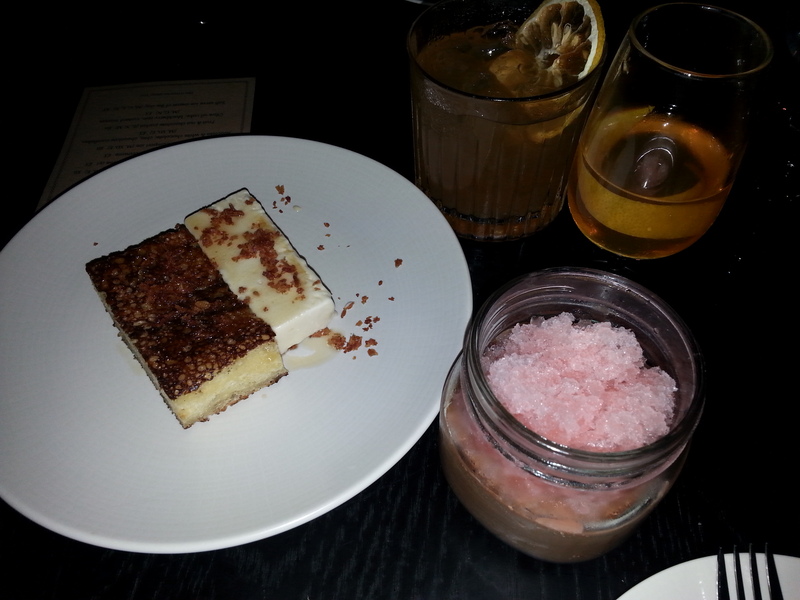 Overall, excellent food and service – and loved the personal touch with the cocktails. Tredwell’s is doing soft opening of 50% until 21/9/14, get in there quick! We went to the pre-launch of the renovated Crib de Rib to check out what they had done. Got a warm welcome from Jean-Claude (Maitre d’) and Paolo (General Manager). Also, enthusiastic Jean-Claude took us on a quick tour of the renovated venue as he was particularly keen on showing us how they had transformed the private dining room with its beautiful ceiling centrepiece, metal work and chandelier, and the other additions of artistic touches adorning the walls. 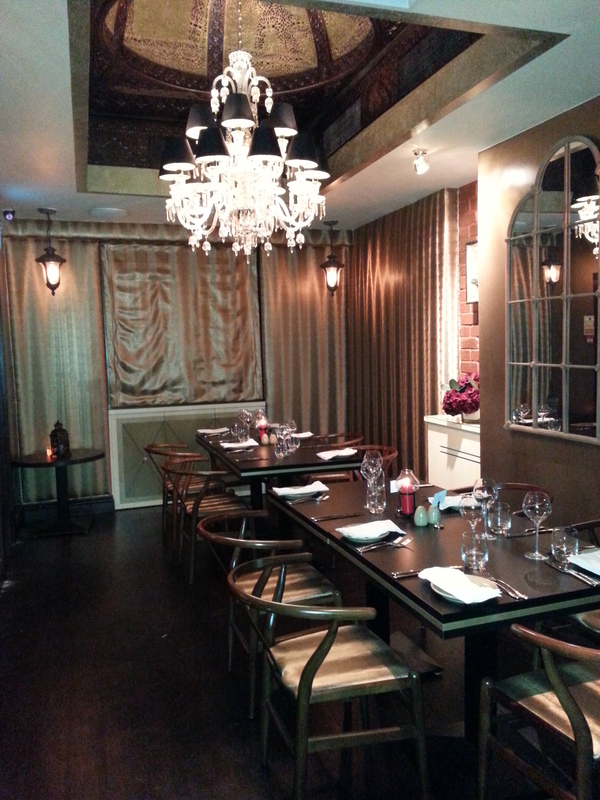 A great, private place to host a diner party or drinks and canapes reception. The two identical chandeliers, one over the entrance foyer and staircase to the lower level and the other in the private dining room, provide a great fluid link between one part of the restaurant and the other drawing you in to investigate the private space. We settled down at our table to peruse the menu whilst Bar Manager and resident mixologist Bastien Dupuy created beautiful cocktails. We started with a Crab Tian (£8.50), beautifully layered with avocado, artichokes and beetroot, which had a sweet and light freshness from the crab; as well as a Charcoal Herb Squid, on the personal recommendation of Jean-Claude, which had a flavourful bois Boudran sauce (made with shallots, tarragon, chives and white wine vinegar) but was slightly disappointing in that it had only three small slices of squid with big piles of dressed rocket decorating the plate. A pleasant dish to experience but I was expecting more squid for a starter, especially after the enthusiasm about the dish from Jean-Claude. 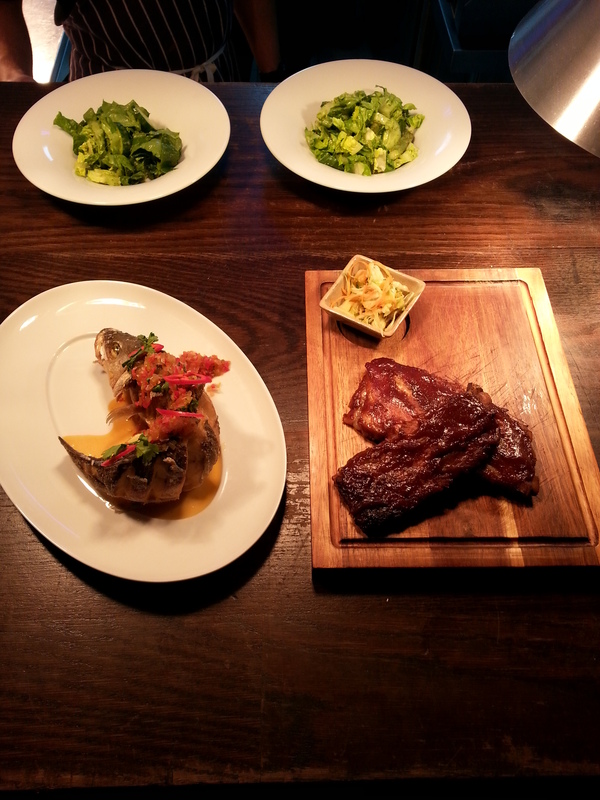 We decided to sample one of their signature ribs and also one of their popular fish dishes recommended by Jean-Claude. The soft, succulent pork ribs (£14.50) came with a tiny dish of crisp apple and carrot coleslaw but had a slightly too sweet generic recipe BBQ sauce for our liking. It possibly could have done with some more spicing in the sauce to help balance out the sweet elements which would have also complemented the natural sweetness from the pork. The spicy sea bass was beautifully presented, all fanned out and was an array of colours with the three spicy chillies, salsa, and garlic and herb sauces; which all complemented the perfectly cooked sweet flavour profile of this fish. Also, the sea bass had a fab crisp skin which added a great texture element to the dish. A harmony made in heaven! 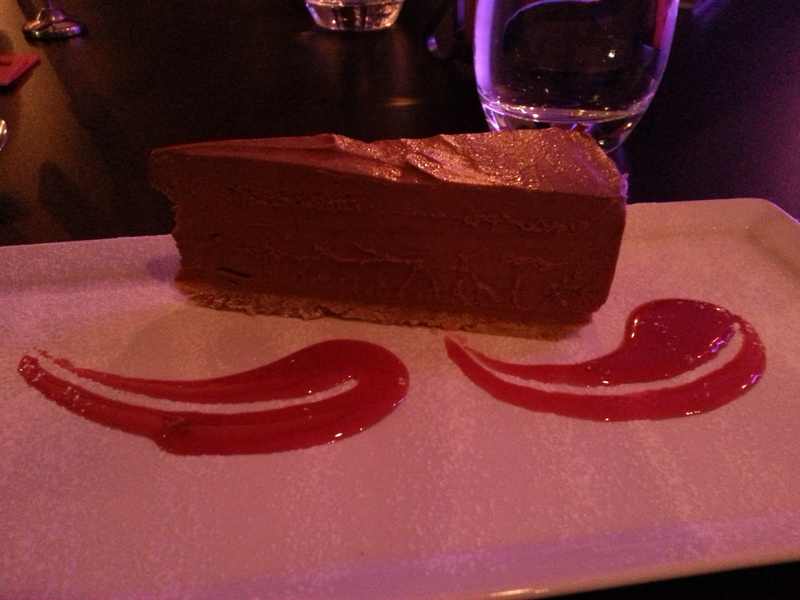 We rounded off our meal with a Triple Chocolate Cheesecake, which had a lovely strawberry coulis, but was slightly too sweet for our tastes. It could have probably done with either sour or tart notes to balance the sweetness from the cheesecake, such as fresh raspberries or a dollop of creme fraiche. Shame though that the Panna Cotta was not ready (not available for another 50mins from when we ordered our desserts) as we had set our hearts on trying this. We had pleasant service throughout the evening but our table was in a slightly awkward spot between the bar and the door so there were constant waiters brushing past, carrying huge platters and cold blasts from the door whenever it opened. 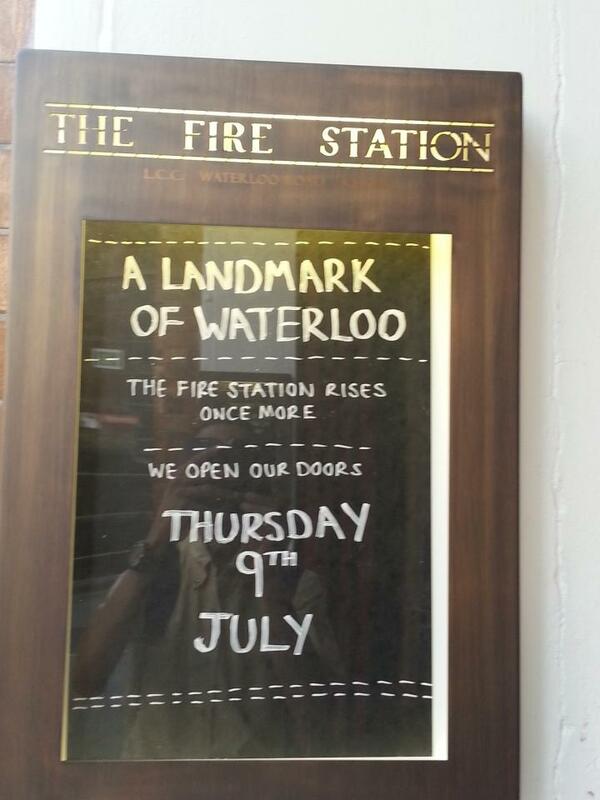 They re-open on the 12th September, 2014. We went The Jones Family Project as we wanted to experience this family-run business based in Hoxton. 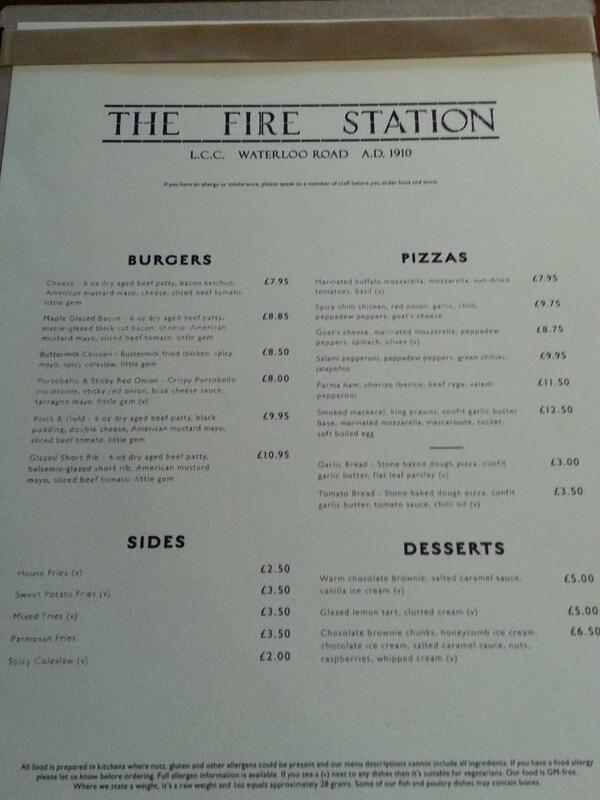 As they were in the process of changing menus, we decided to go with taking a snapshot from the past and future. Whilst we made our menu selections during chatting to the friendly Anna (Anna Watts, one of the owners) and Cristiano (executive head chef and also co-owner/founder) to get an insight into the new dishes, as well as being taken on a tour of the premises, we sipped on cocktails of a rum negroni (with a refreshing addition of grapefruit – from the current cocktail menu) and a peashoots pisco mojito with pisco aba, lime juice and honey (from the new cocktail menu soon to arrive). It reminded us of pisco sours we had enjoyed whilst on holiday in Peru. Loved the art by Fanakapan in the private events entrance on Rivington Street – with his creation of a Mad Hatter’s Tea Party, pots with elegant character by Fian Andrews, and the general design and decor of the restaurant. A wonderful, bright and airy space with the novel additions of tree dotted around. They even had gnomes behind the bar – by Tusch und Egon. We tucked starters of lightly spiced squid and crispy aubergine involtini (from the current menu), mains of baked salmon, Jones’ Chuck burger and creole spiced chicken with a lime mayo and vibrant salsa (from past and future menus), and desserts of orange tart and brandy bread and butter pudding. The baked salmon was enjoyable but we would have preferred the original seabass on the current menu, as salmon has too strong a flavour for this lighter dish. However, loved the heat from the creole spices on the chicken which went perfectly with the lime mayo and the palate cleansing salsa. Also, the burger was juicy and complemented by the pickles. Even though we were stuffed by this point, we had a duty to our readers to soldier on and we dived into our dessert which were very moreish – and a great end to the meal. We could not leave without trying two more cocktails from their new summer menu, so we opted for the basil and lavender mojitos. They are light, fragrant and have floral notes and are perfect to bring the summer in! Thank you to Anna, Cristiano and team for looking after us so well, and for excellent cocktails and food. 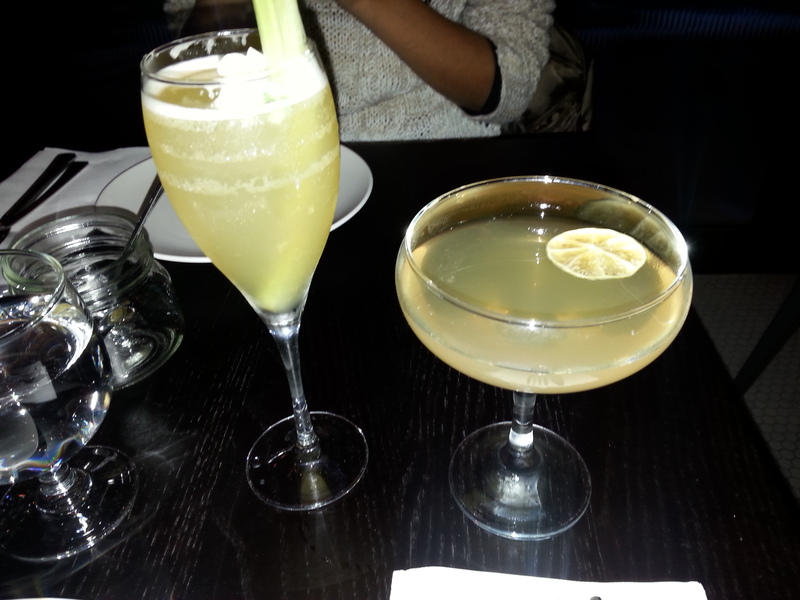 We had a lovely time and will be back again very soon, especially to give your new cocktail menu a proper workout!